Created as a masterpiece to honour the great ballerina Anna Pavlova, this scrumptious dessert is served on a perfect meringue which has a crunchy shell yet a sticky gooey center filled with lavish spoonfuls of sherry custard cream topped with fresh fruits. Generally served in the summer time there is much discussion on the bragging rights. Anna Pavlova was born in Russia and died in the Netherlands at the young age of 50. She is the first ballerina to start her own ballet troop that toured the world. Legend has it that the pavlova was created during her tour of New Zealand in the 1920's. It is now an equally popular dish in Russia, New Zealand and Australia and often served on festive occasions. The final product topped with fresh fruit of your choice. Preheat the oven to 275 F/ . Beat the egg whites and cream of tartar until it is frothy and comes together and then start adding the sugar very slowly 1 tbsp at a time until soft peaks are formed and it turns glossy. Spread out on a 9 inch/23 cm buttered paper placed on a tray or in a buttered oven proof pie dish. Using the back of the spoon smooth it out making a dip in the center as in the picture below. Be very gentle. If you wish to make the edges fancy, place one third of the meringue in a large piping bag and finish it with edges. Bake for 1 hour until a light pinkish hue appears. Turn the oven off and allow it to cool inside the oven. This is the ''drying'' process of the meringue. you will need two cups of prepared fruit for this recipe. Choose firm fleshed fruits that do not disintegrate quickly. Prepare them by peeling and dicing. Toss in a bowl. Cover tightly and keep refrigerated for up to 24 hours. Add a touch of lime or lemon juice, a pinch of salt and a dash of sugar to bring out all the flavours. An electric hand beater is perfect for this. The pie dish is what you will serve it in. It cannot be removed on a platter once baked. The egg whites must be at room temperature. 3/4 tsp of lemon juice is a good substitute for cream of tartar. Do not over beat and dry out the egg whites, the test to see the soft peaks is to remove the beater from the bowl and if the little peak of meringue on the edge of your beater is glossy and stays pointed it is done. You can make small individual ones if you prefer, reduce the baking time to 45 minutes. This quantity will make 12 small meringue shells. 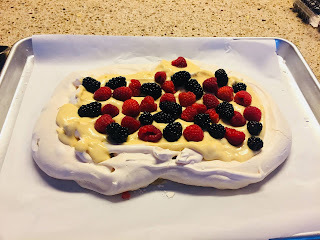 A mango Pavlova is also delicious with a few blueberries tossed in it for colour. Peaches are delightful too. Adding a teaspoon of Sherry or Limoncello is also an option to consider specially if you think your fruits are not as delicious as they look. Your meringue will depend a lot on your weather. If it is damp and rainy it is very hard to get a crisp dry meringue. Click Creme Patisserie for other optional recipes on Niloufer's Kitchen using this custard. Read more about Niloufer's Kitchen in the Huffington Post Bloggers Club. The French In My Food. April 01, 2018 Zubeida Mirza Tried the pavlova on Easter weekend Niloufer Mavalvala! !